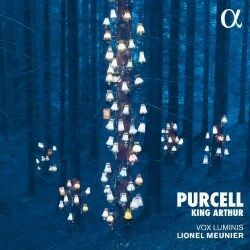 Purcell’s King Arthur is considered a semi-opera, though the musical content we are handed down in today’s recordings ignores the spoken texts by John Dryden, and as such what we have might arguably also be categorised as incidental music to a play – but what music indeed. More than a few pieces from King Arthur have been mined by Michael Nyman for his film soundtracks, and while Purcell’s better-known full opera Dido and Aeneas has the full works when it comes to dramatic shape, King Arthur can challenge it note for note in terms of sheer quality. This release from Alpha Classics comes with the libretto printed in full, both in English and translated into French. Vox Luminis has made glorious recordings of Bach and Handel, Buxtehude, Schütz and others for the Alpha label, so expectations for this King Arthur are high, and for the most part they are met with aplomb. Sound quality is excellent, and the instrumentalists make up a superb ensemble with plenty of stylish character. The vocal cast is also strong throughout, with Stefanie True’s purity of tone as the Priestess, Robert Buckland’s rhythmic incisiveness in Come if You Dare and Sophie Junker’s virtuoso seductions as Cupid deserving of mention, though these have been picked out almost at random. The only point at which things seem a little constricted is Purcell’s Vivaldi moment; the Cold Genius’s aria What Power art Thou. The tempo is too swift here to allow for much by way of shivering vocalisations from Sebastian Myrus, or indeed stringed inventiveness from the players short of a nicely glassy sound from the violins to hint at the ice implied in Purcell’s enigmatic markings in the score. Enjoyment aplenty is to be had in this recording despite minor caveats, though this is very much a concert version of King Arthur, with few if any hints at theatrical effects. The only mildly unbuttoned moment being in Act V, with Olivier Berten as Comus with his Peasants and the rest of the band allowed some amusing drunken revelling, though even here they never entirely loose control. Any new recording of King Arthur will have some competition to content with, in particular that on the Erato label with Les Arts Florissants conducted by William Christie (review), at least when it comes to CD rather than DVD releases. This particular recording has been at the top of the heap for this work for more than a decade, being both musically satisfying and convincingly theatrical at the same time. I would say that honours are about equal in terms of performance between these two, with gains to be had from this Alpha Classics release with an extra track of Altar Music after the overture reprise, one of a few added repeats along the way that add substance and structure to the whole. William Christie does get more dramatic variety out of his singers however; that Cold Genius aria a suspenseful 4:12 to Lionel Meunier’s somewhat superficial 2:56. On the other hand, that remarkable chorus See We Assemble Thy Revels to Hold gets a measured tempo from Meunier which is almost exactly the half of Christie’s jaunty version, repeated with sneezes from the chorus. If you prefer straight performance without theatrical extras then this Vox Luminis recording could very well be the one for you, and in any case I wouldn’t hesitate to recommend it – this is a very fine performance and production by any standards.